It is so natural to moralise about posture that we often do it without even noticing. We often apply such terms as “bad” or “good” or “lousy” to our alignment & physiognomy without even pausing to consider the moral judgement implicit in such labels. I believe it is useful to recognise this tendency, and to appreciate that posture in itself is neither good nor evil, rather “’tis thinking makes it so”. Until you make the unconscious conscious, it will direct your life and you will call it fate. 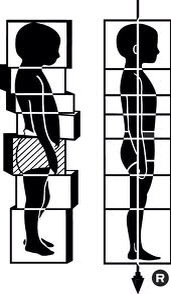 Our job through Rolfing® intervention is to make these choices conscious rather than habitual so that if my head falls off, it’s because I wanted it to.